For my English 2200: Sport Literature class I had written my final paper which compared and contrasted Richard Wagames “Indian Horse with the Soiux Lookout Black Hawks. Although this paper was written for a different class, I found the relationship with my research paper was simular. Sport was introduced into Residential Schools in the 1940’s and 50’s in hopes of assimilating Aboriginal students into the Canadian way of life (Hiwi 85). The sport which exemplified Canadian culture the most was hockey. In Richard Wagamese “Indian Horse” and Braden Te Hiwi and Janice Forsyth’s “‘A Rink at This School Is Almost as Essential as a Classroom: Hockey and Discipline at Pelican Lake Indian Residential School, 1945-1951” the sport of hockey is identified as a way to transition Aboriginal Students from their own culture to a Canadian colonized culture (Te Hiwi 83). Muscular Christianity was taught from playing hockey as Aboriginal players could learn the proper morals that came from the sport. For Aboriginal student-athletes, hockey became an safe haven where playing the sport allowed students to escape the abuse in Residential schools. However, hockey became a platform to showcase Aboriginals assimilation to Canada identity, which caused incidents of racism from white fans and reporters. The sport of hockey in the Residential school system showcased Aboriginal assimilation and transitioning into a Canadian identity. The residential schools at Pelican Lake and St. Jerome’s treat hockey as a kind of “Muscular Christianity” where their belief is “the development of good Christians through sport and games by instilling character traits such as courage, toughness, self-reliance, and sportsmanship in athletes” (Hiwi 86). Boys of Pelican Lake Residential School specifically were introduced into hockey to fulfill the Christianized and Canadian identity. Pelican Lake Residential School developed into the Sioux Lookout Blackhawks and would excel in Muscular Christianity as the Bantam team would go on to become the Thunder Bay District Champions. However, to excel or graduate from the hockey program, they had to exemplify behaviour depicted by their opponent as showcased by ‘‘it was the first hockey team which had ever behaved properly!’’ (Hiwi 95). Similarly, hockey was implemented into the Residential School in “Indian Horse” as an attempt to achieve Muscular Christianity. Saul Indian Horse uses the sport of hockey to progress his values and morals to create a Canadian identity. When the opportunity arose to graduate St. Jerome’s Residential School, he would have the ability to integrate into a colonized life: “he will have the benefit of a good home and good schooling. We will have achieved our mission” (Wagamese 96). The importance of achieving Muscular Christianity from Saul Indian Horse and the Sioux Lookout Blackhawks would be beneficial in the Churches and Governments perspective as they transitioned into a Canadian identity. Life in Residential Schools became a place savagery as the church tried to expel the Savagery of Aboriginal students. Savagery came through the form of sexual, psychological and physical abuse from the nuns, priests and teachers who were in charge. Livelihood of Aboriginal Students in Residential schools came to the point where students had taken means into their own hands. Throughout Richard Wagamese “Indian Horse”, Saul returns to past memories of students he saw take their lives due to the abuse that was given in St. Jerome’s Residential School. Throughout his years at St. Jerome’s he had used hockey in the way the school intended the sport for him: to assimilate into Canadian culture. Hockey had integrated Saul into Canadian culture so the teachers did not have to. Sauls school life at St. Jerome’s was contrasting to other students as he was able to escape abuse due to his ability to perform on the ice. His hockey career created an identity which Saul could follow in order escape Residential School life: “In the spirit of hockey I believed I had found a community, a shelter and a haven from everything bleak and ugly in the world” (Wagamese 90). Similar to Saul, sports at the Pelican Lake Residential gave students an opportunity to escape their school life: “[sport] made their lives more bearable and gave them a sense of identity, accomplishment, and pride” (Habkirk 3). These aspects of sport were sought after at Pelican Lake where many students would practice their hockey skills with hopes of making the Blackhawks (Hiwi 95). In addition, Hockey’s popularity came as a way for students to escape their students life and explore sport to cope with the abuse Residential schools have created (Habkirk 3). Travel had been intriguing part of the Hockey team where players would have the opportunity to leave School for a period of time to compete. The time spent away from residential schools allowed the student/athletes to reset from their school life and focus on Hockey instead. The implementation of Hockey in Residential schools had created a safe-haven for students to use sport to escape the abuse from the teachers in the school. However, escaping the abuse through Hockey still provided a transition into a Canadian identity. Showcasing Aboriginal athlete playing Hockey against white, Canadian athletes proved to Canada that assimilation of Aboriginals to Canadian culture had been transitioning. However, Hockey in Residential school faced racism from the Canadian population in order to create separation of the two peoples. Although Hockey was enforced in the transition to make Aboriginals into Canadians, hockey was still an aspect of Canada which Canadians took seriously. When Saul left St. Jerome’s to play for the Moose, he would find that assimilation to Canadian culture would not change Canadians perceptions of Aboriginals. The Moose faced many accounts of racism as they were depicted as ‘others’ and their Hockey skills surpassed the “white guys” (Wagamese 118). For Canadian fans, their views towards the diversity on the ice would be made clear towards the Aboriginal teams: “The crowd reacted whenever he read out a particularly Indian-sounding name, shouting out jibes and taunts” (Wagamese 124). Similar to the Moose, the Blackhawks performances caught Canadians off guard as the team would exhibit high end skills on the ice. However, reporting on the Blackhawks performance would never surpass the cultural view that they were still Aboriginals: ‘‘there was no scalping, rough-house or angry words. Just clean play, goodwill all around and smiles, especially Indian smiles” (Hiwi 100). However, the Blackhawks would have their performance exploited by the Churches and Government in an approach to prove the assimilation to Canadian culture. Examining the Aboriginal athletes assimilation to Canadian culture was showcased as the Blackhawks would enter a three game tour which broadcasted the Aboriginal team playing White teams. Throughout the tournament, media coverage would prove the government and churches role in the Residential School systems helped transition Aboriginal Students to assimilation into a Canadian identity: “The Blackhawks could engage Canadians’ interest in hockey, show the success of residential schools, and offered visible proof that First Nations peoples could compete against whites on equal terms” (Hiwi 97). The Blackhawks created a platform for the Government and Churches to showcase and exploit Aboriginals of their assimilation to Canadian identity. Since Aboriginal students had begun transitioning into a Canadian identity, Canadians and Aboriginals would now be equal. However, the acceptance of the transition of Aboriginals students into Canadian culture would cease to exist at this time as Aboriginals experienced racism from Canadians. In Richard Wagamese “Indian Horse” and Braden Te Hiwi and Janice Forsyth’s “‘A Rink at This School Is Almost as Essential as a Classroom: Hockey and Discipline at Pelican Lake Indian Residential School, 1945-1951” the sport of Hockey in the Residential School system showcased Aboriginal assimilation and transitioning into a Canadian identity. Muscular Christianity was identified from Hockey as Aboriginal players could learn the proper morals that came from the sport. For Aboriginal student-athletes, hockey became an safe-haven where playing the sport allowed students to escape the abuse in Residential schools. However, Hockey became a platform to showcase Aboriginal students assimilation to Canada identity from Residential schools. In conclusion, Residential schools have used the sport of hockey to transition and assimilate Aboriginals students into a Canadian identity. Habkirk, Evan J, and Janice Forsyth. “Truth, Reconciliation, and the Politics of the Body in Indian Residential School History.” ActiveHistory.ca, 27 Jan. 2016, activehistory.ca/papers/truth-reconciliation-and-the-politics-of-the-body-in-indian-residential-school-history/. Te Hiwi, Braden, and Janice Forsyth. “‘A Rink at This School Is Almost as Essential as a Classroom’: Hockey and Discipline at Pelican Lake Indian Residential School, 1945-1951.” Canadian Journal of History, vol. 52, no. 1, Spring/Summer 2017, pp. 80–108. EBSCOhost, doi:10.3138/cjh.ach.52.1.04. Wagamese, Richard. Indian Horse: a Novel. Douglas & McIntyre, 2018. Learn a vast majority of things in one particular subject, Writing. Activity based learning is a primary focus which has been distributed by the teacher. ontario Secondary School Honours Graduation Diploma or “Senior Matric. Hi, my name is Charlie Bringloe and welcome to my History 3510 ePortfolio. I would like to take this time to introduce myself to you. I am currently a fourth year at Thompson Rivers University, originally from Waterloo, Ontario. I came to Kamloops after I had finished high school on a volleyball scholarship to TRU. I am currently a fourth year in the General Studies Program with aspiration of entering the education after completing my degree. I took this course to gain better knowledge on the History of Childhood and Education as I see this would benefit my knowledge of teaching. For my research project I choose to look at the Physical Education System in Residential Schools from the late 1800’s to mid 1900’s. My reason for this area of work is due to my passion for sports and activities, and also my family history of the Residential school system. I hope this ePortfolio provides you with new information that attends you to the History 3510 Childhood and Education course! An assignment to compose your own life story came after the reading from Mary Cathernine Bateson’s “Composing a Life Story.” The purpose was to compose a life story regarding an aspect of you’re life growing up. What has always been apart of my life is sports and activities. This story analyses how my life has been developed through sports and activities. Enjoy! At a young age it became apparent that I was going to be involved in sports throughout my life. Looking back at home videos of christmas morning my first gift was a basketball and hoop. My childhood consisted of riding bikes, playing basketball, skiing and snowboarding, and engaging in water sports in the summer. In kindergarten they asked us to draw what we wanted to be when we grew up; I drew a dirt bike racer. As I began to grow into a pre-pubescent stage I picked up the sport of baseball. I found my tall stature and hand-eye coordination allowed me to succeed in the sport at a young age. At the dinner table parents would ask what I wanted to be when I grew up; similar to before I had said profession baseball player or snowboarder. Getting into my teenage year I left the sport of baseball to pursue the sport of Volleyball. I noticed the skills I learned in baseball when pitching helped me spike harder than my other teammates who had picked up the sport at the same time as I. My progression in volleyball grew and grew as I competed on the top teams in Canada and playing for the provincial team in the summer. As I became closer to graduation high school I found myself at the dinner table with people asking what I was going to do post high school. My answer still hasn’t changed. 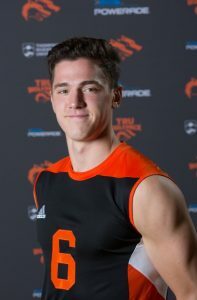 With volleyball scholarships to various universities in Canada I was given the opportunity to continue playing the sport I love while continuing an education which can give me a fallback plan if continuing my athletics runs out. I’ve found the ability of pursuing goals in sports throughout my childhood to benefit myself as I make my way into adulthood. However, as I grow up I’ve realized my dreams are beginning to come true.